Visiting Rome in 2 days with your children will be a piece of cake. The Italian capital city offers its young visitors a lot of activities and places to see. There are many parks, museums and events that you will be able to fit into your itinerary. If you wish, you can follow the 2 day Rome-with-children itinerary we have designed for you! This itinerary is only a suggestion: you can adapt and modify it according to your interests and the time you would like to devote to each activity. We advise you to use our Roma Pass for your visits. It will allow you to benefit from discounts and additional services while you visit museums and attractions in Rome. BUY YOUR ROMA PASS HERE! Villa Borghese, the ideal place if you want to visit Rome with your children. The first day of our 2 days Rome itinerary for a visit with children includes a stop at Villa Borghese. With its 80 hectares of green (roughly 200 acres), it is one of the biggest public parks in Rome, as well as one of the most famous. It is an oasis of serenity, offering several activities for families: it is possible to ride a bike through the park without having to worry about cars. The park houses the Carlo Bilotti museum, very small but with valuable works of art. It hosts 18 works by Giorgio de Chirico and a portrait of Bilotti’s wife and daughter, performed by Andy Warhol. The admission is free and a visit does not take long so it could be a good idea to visit it, if the children are not too small. From the museum, go to Piazza di Siena, where horse racing and summer concerts are currently organized. Near the square you will find the Casina di Raffaello, a playground for children from 3 to 10 years old. Here children can play and listen to animated readings and participate in one of the many activities organized by the toy library. But the place that you will certainly enjoy the most is the Biopark, which hosts about 1100 animals from 200 different species and is definitely an attraction that your little ones will surely love. The biopark extends for 18 hectares and also organizes children’s didactic laboratories. Refreshed and rested start your afternoon step of this itinerary to visit Rome in 2 days with children: EXPLORA, a museum dedicated to children from 0 to 12 years old. It is set up as a child-sized miniature city, where everything can be experienced, touched, lived. The museum opens at 10am and the visit (not guided) takes about 45 minutes. It is advisable to book on weekdays and it is surely necessary to do it on weekends. Reserved tickets must be picked up at the ticket office 15 minutes before the check-in time, otherwise your reservation will be canceled. The museum is very engaging and your kids will love it. The property is located at Via Flaminio at number 82. From the Bioparco you will have to take a half-hour walk. The Colosseum, one of the main attractions of Rome. On the second day of our itinerary to visit Rome in 2 days with children, we propose a visit of the Colosseum (accessible to the disabled), the attraction that most of all represents the capital. It is undoubtedly the most fascinating of Rome’s monuments. It was in fact the place where the gladiators fought to their last breath and the condemned to death fought against the lions in front of an ecstatic audience. It can be visited on two levels and most of the structure of the arena is still visible. Reserve about one hour for the visit. If you have the Roma Pass you can skip the queue and save valuable time, in addition to avoid getting the kids tired even before entering. When you go out of the Colosseum continue the itinerary along the Via dei Fori Imperiali, at the end of which you can admire the Trajan’s Market and the beautiful Trajan Column, which describes with beautiful bas-reliefs the military campaigns of the Emperor Trajan against the population of Daci. Get up to Piazza Venezia and climb the Vittoriano stairs. If you do not want to be reprimanded do not sit on the steps (it is forbidden to sit down for respect to the tomb of the unknown soldier to whom the monument is dedicated and the controls are robust). Enjoy the magnificent view by climbing up to the terrace with the elevator located to the side of the monument and then have a lunch in the area and rest. After the break, you have two alternatives on this itinerary to visit Rome in 2 days with children: you can bring your children to the Wax Museum, the third largest in Europe for the number of collected characters. It contains a collection of 250 wax figures including, in addition to popes, politicians and poets, Barack Obama, Francesco Totti and, for the joy of the girls, Biancaneve. 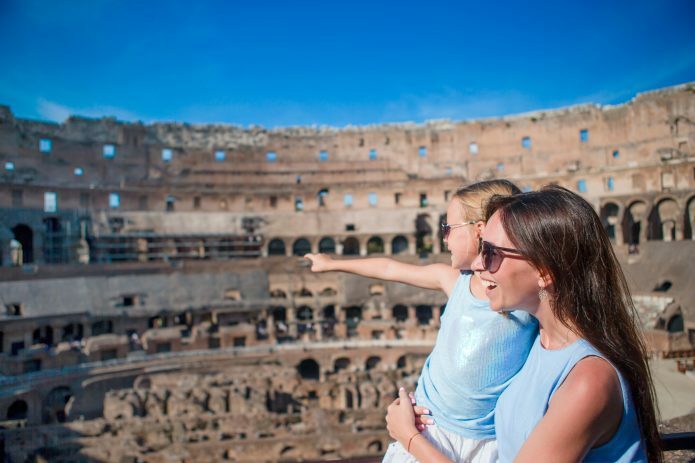 Alternatively you can bring your kids to the Time Elevator, a 3D cinema inaugurated in 2005, where it’s worth seeing the show on three scenic screens, Time Elevator Roma, a virtual trip in a 45-minute flight simulator during almost 3,000 years of Roman history. The show start every hour. The wonderful fountain of Trevi is among the things to see in Rome. Continue the afternoon until you reach the Trevi Fountain, another of Rome’s capital attractions around the world. The sculptural complex of the fountain occupies almost the whole square. As a result of a recent restoration, the Trevi fountain today is visible in all its original splendor. Make the inevitable usual photos and then take the via del Corso (the shopping street) where you will be able to shop for the whole family. Finally come to Piazza del Popolo, where you will find a 23.9 meters obelisk. It is the first obelisk to be transported to Rome at the time of Augustus, to celebrate the Emperor’s victory over Egypt. Initially it was placed at the Circus Maximus. Our itinerary to visit Rome for two days with children ends up here.